High polishing performance, extreme manoeuvrability, dust vacuuming and simple operation are just a few of the advantages of the Cleanserv PD51/2000. A variable handlebar allows you to support safe working practices for the operator with ergonomic design. 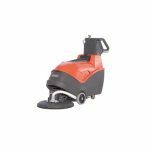 It provides gleaming results on coated floor surfaces and is ideal for use in schools, department stores, hospitals, warehouses and offices. A disposable dust bag captures extracted polishing dust filtering the air. Cleaning up to 1,600 m² per hour, brilliant results on laminated floors are guaranteed. The PB51/2000 has a tool free and easy change system for the various kinds of pads.